The universe looks pretty much the same close by as far away, whichever direction we look. (The technical terms are homogeneous and isotropic.) That means we can break the universe up into relatively small cubes and study one box as a stand-in for the entire cosmos. Observations of galaxies show them to be getting farther from us, which we can understand using the “box” picture: each cube is growing larger, so it’s not that the galaxies are actually moving, just that all separation distances are growing. The contents of the box are affected by the expansion of the box, but they also determine how it expands. The history of the box therefore reveals the history of the entire universe. Looking across the universe to other boxes is the same as looking into the past, so we are able to determine the size of the observable universe and something about the whole cosmos. A very rapid period of expansion in the early universe called inflation insured that the universe is homogeneous and isotropic today. It also made the universe nearly flat: initially-parallel light beams stay parallel. Inflation and flatness ultimately are the justification for the entire “cosmic cube” picture. Expansion of the cosmic box, from the Big Bang until today. This post is most concerned with the second and third boxes from the top, before any galaxies or stars. If the cosmic boxes are getting larger as time passes, that means in the past, they must have been smaller. Since each box contains gas (and other ordinary matter) and photons, in the past, things must have been much hotter than they are today: both ordinary matter and photons heat up when compressed. Back when the universe was very young, then, it couldn’t have looked much like it does today: no galaxies and no stars, since there wouldn’t be the right conditions for them to form. During the whole Soup Period (my cosmology colleagues have rejected my proposed name for it), the cosmic boxes continued to expand and cool, so gradually things began to calm. The soup was more like a puree than a chunky stew: the density was pretty close to being the same everywhere, but tiny variations were still there, just like if you put a thick cream soup under a microscope, you’ll see that it’s not the same texture throughout. The difference is in the way the fluctuations work: recall that the universe was a plasma in this stage, so it could flow more freely like a gas. Small fluctuations in density are sound waves, though these wouldn’t have been coherent sounds: more like the hiss of white noise, a random mixture of all sorts of frequencies. When the cosmic boxes got big enough, things cooled down and the universe became transparent. This wasn’t an instantaneous thing, but it was still relatively quick in cosmic terms: the free electrons in the plasma could join up with atoms, liberating all the photons in an event called recombination. (That’s a bit of a misnomer, since it was really the first combination, but we’re stuck with the name anyway.) Most of those photons will never hit anything again: they’ll fly in straight lines as the universe expands, and the chances of striking another atom again are pretty slim. That’s good for us: if we build telescopes, we can detect some of these photons. When they were emitted, the universe was about 3000 Kelvins (4900° F), which is but it’s cooled a lot since then, and now it’s 2.7 K (-455° F). Based on our understanding of the thermal spectrum (also known as the blackbody spectrum), we know that temperature corresponds to microwave light, so the pervasive photons left over from 380,000 years after the Big Bang are known as the Cosmic Microwave Background (CMB). 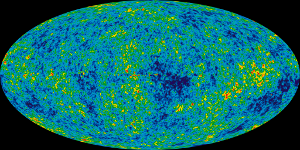 The map of the Cosmic Microwave Background, created from data collected by the Wilkinson Microwave Anisotropy Probe (WMAP). Clicking on the image will take you to the WMAP website, which has a lot more information! The CMB reflects the contents of the universe at the time it formed, but also the fluctuations in density, which express themselves in tiny temperature variations. However, the scale and magnitude of the fluctuations reveals the sound waves, and in turn that tells us something about the formation of galaxies…which reveals our own history. If the fluctuations had been slightly larger or smaller, the universe would look very different than it does today. If there had been no fluctuations, we would not be here at all. These fluctuations are the source of the colors in the picture on the left, though it’s important to note that the difference between the hottest spot (marked in red) and the coldest (in blue) is on the order of 10 millionths of a degree! This is the sky in microwave light, so you need to imagine being at the center of a globe, with these microwaves streaming toward you from all directions at once. Most of these temperature variations are smaller than the size of the Sun on the sky, and regions that seem larger are where our brains have tricked us into seeing patterns that aren’t there. Flipping a coin many times will produce “runs” with all heads or all tails that may seem to show there’s something going on beyond randomness, but it’s within the realms of ordinary probability, and that’s what’s going on in the CMB spectrum too. 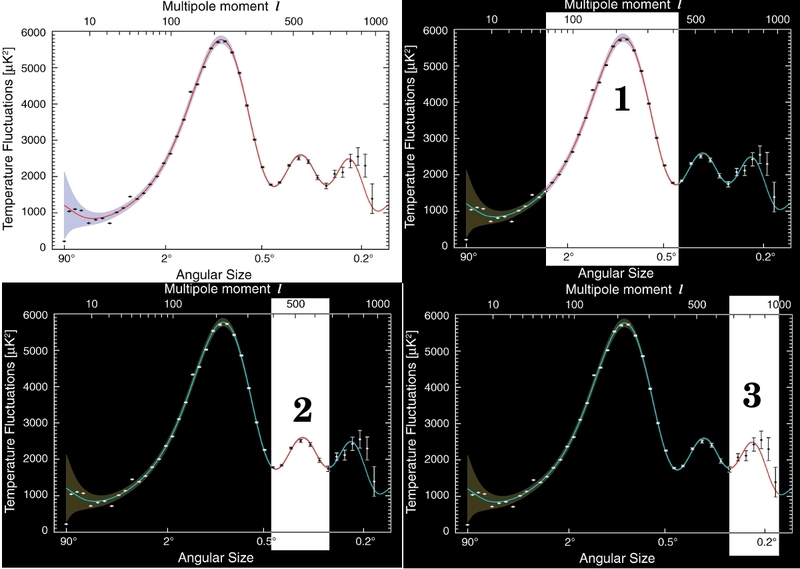 The next step is to take the sizes and magnitudes of fluctuations over the sky, which is the series of images below. The left side of each image represents the largest scales on the sky, and as you move right you’re looking at smaller and smaller temperature fluctuations. The technical name for this is the power spectrum, since it’s a measurement of the rate of energy carried by the CMB photons as they arrive at WMAP. The three peaks are key: they will tell us exactly what the contents of the universe are! The CMB power spectrum, with the three "peaks" highlighted. The numbers on the peaks correspond to the descriptions in the text below. The first peak contains information about the total amount of stuff in the universe: ordinary matter, dark matter, photons, neutrinos, dark energy, and anything else we might not yet know about. The size and location of the peak is related to the geometry of the universe: how “flat” it is. Note that this peak covers areas of the sky much larger than the temperature fluctuations we’re seeing (the Sun is 0.5° on the sky! ), so it’s not produced by sound waves in the early universe, but by the total energy driving expansion. The second peak is the sound waves, and tells us exactly how much ordinary matter there is in the universe. 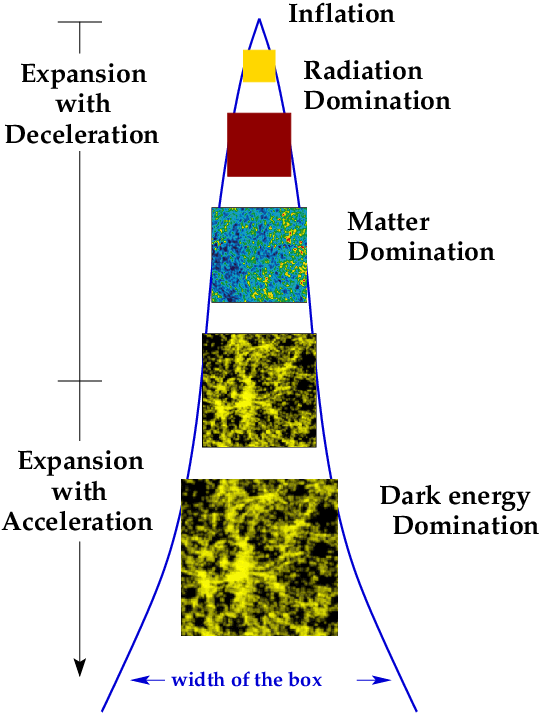 The third peak takes into account both the ordinary and dark matter. Combining this with the second peak therefore gives us the amount of dark matter. So now we have it: by taking the three peaks together, we have the total amount of matter, the total amount of ordinary matter, and all the stuff together. Combining this data in different ways gives us the amount of dark matter (peaks 2 and 3) and dark energy (peaks 1 and 3). That plot is one of the major ways we know everything I talked about in this series of posts! When you combine the results from WMAP with galaxy observations and supernova data, you arrive at the state of the art in cosmology. The Cosmic Microwave Background is often described as the “baby picture” of the universe, and I can see why: it’s a map of how things looked when the universe was very young. However, when I was assembling my thoughts for this post, I thought of another metaphor, from biology: the CMB is the genome of the universe. Just as our genes code for traits that develop over our growth, the CMB codes for how the universe grows and evolves, telling of the potential options it can choose from as galaxies form, merge, and grow old. The fluctuations are the chromosomes of our cosmos, their colors are the key to our comprehension of our past and future.